cupcakes – Of design, coffee and everything in between! Twas a close friend’s baby shower this weeekend! Very happening event! The decoration was done by her sisters.. Very creative and well done! 🙂 My favorite would have to be the hanging clothes with lights (as per in photo above). There was also a photo booth with props for all the guests to take pictures with. Haha. The cupcakes and cake were also done by her sisters! Very cute. The theme was blue and pink. 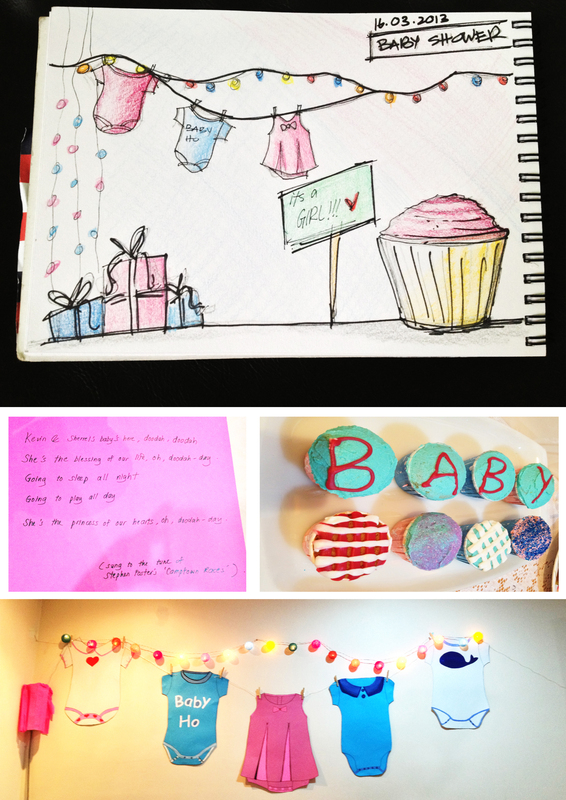 Guests were asked to dress in blue if they hoped the baby would be a boy and pink if they hoped it would be a girl! I must say, almost 90% were in pink! Haha. We, well *I* was really happy to hear the announcement it was a girl! Yeay! 🙂 Can’t wait to see which name the happy new parents will pick out!